Premiere Rush CC, is a new Premiere Software, that will launch: a video-editing app made for YouTubers - antoniocudemos Webseite! Later in 2019, Adobe will launch their newest app, made for Youtubers. Adobe says the app is “designed specifically for online video creators”, and exporting options optimized for every social platform including Snapchat, Instagram, Facebook, Twitter, and Vimeo. 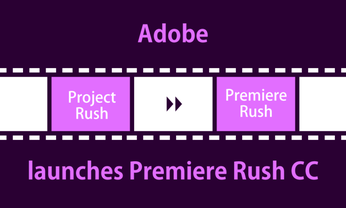 Premiere Rush CC, or Project Rush as it was called when it was first revealed at VidCon this year, is Adobe’s solution for YouTubers looking for an all-in-one video editing program. It’s to simplify the video-editing, motion graphics, and audio mixing capabilities of Adobe’s professional software like Premiere Pro or AfterEffects. Premiere Rush CC also offers a very cool one-click auto-duck audio mixing feature that automatically adjusts the volume of the background music during voice-overs. It’s an artificial intelligence framework that’s built into the Creative Cloud platform. Color correction system is built on top of the same technology that powers the more fully featured Premiere Pro. It can easily sync between platforms, giving creators the ability to start editing on their phone and finish their edit on a laptop.